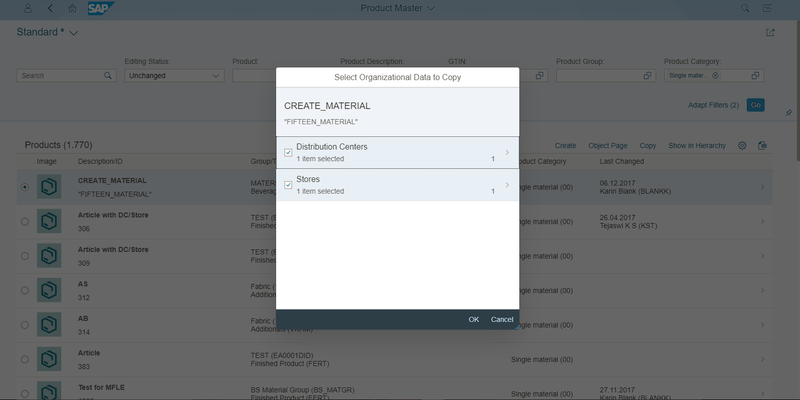 Unlike the traditional way of single article [ MM41/42/43 ] creation, the Fioritized “ Manage Product Master Data” application unveils us a new way to create single articles via user friendly interactions. Selecting the product Category as “00” we can filter the Single articles in the system. Click on Create -> Single Article. This would open up the pop up where the mandatory fields can be entered. Click on OK to navigate to the object page of single article. Clicking on the tabs or anchors on the top would take us to the specific sections accordingly. Enter the required fields and click on Save. Search for any single article, select the record and click on “Copy” button. The copy pop over appears. This populates all the Distribution Centers and Stores available in the article. The user can choose to de-select/selected the required Distribution Center and store and clicks on OK button which would take us to the single article object page. Enter /Change the required fields and save the article. The global reference Distribution Center is maintained in the table TWPA. 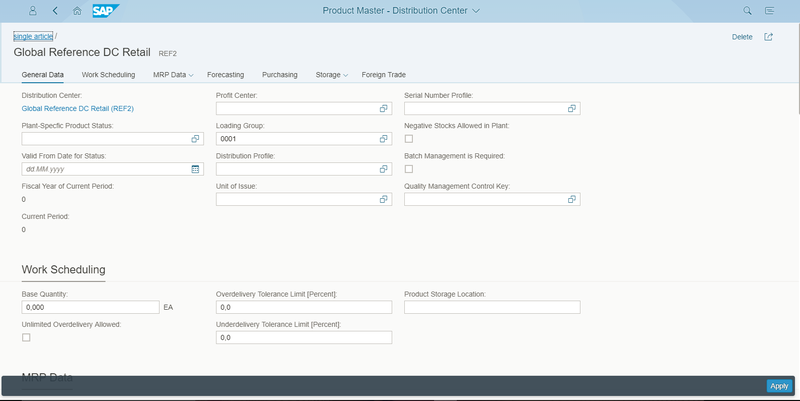 Every time “+” button is clicked under the distribution center section; the global reference Distribution Center would be defaulted for the first time. From the second time, the Distribution Center can be filled from the F4 help which picks up the Global Distribution Center as the reference. The global reference store is maintained in the table “TWPA”. Every time “+” button is clicked under the store section; the global reference store would be defaulted for the first time. From the second time, the store is allowed to be filled from the F4 help which picks up the Global store as the reference. Along with the global reference store, there is a possibility to maintain Sales Organization level reference stores. For E.g for a Sales Org “0001” and Distribution channel “10”, if there is a reference store “REF2” maintained. Now by clicking “+” button under store, if the user enters a store [ e.g STR1] which has sales Org as “0001” and Distribution Channel as “10” then the user would be prompted to first enter the Reference Store “REF2”. And then the user would be allowed to maintain the store “STR1”. This store “STR1” would pick up the reference from the Sales Org specific reference store “REF2” and not the global reference store. Thanks for this Nice Blog. 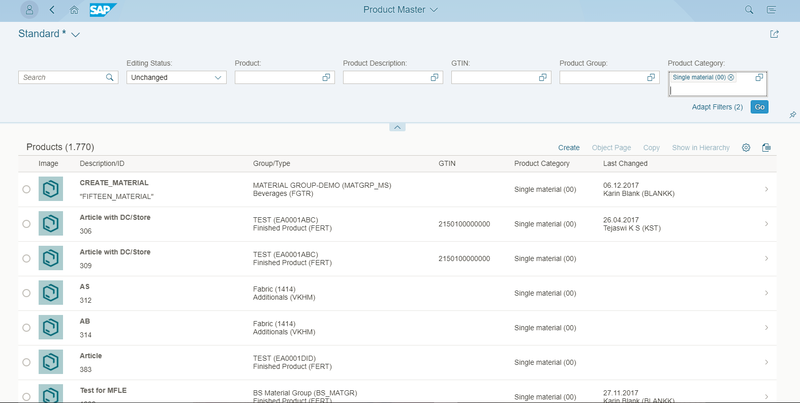 We are using the product master Tile on our S/4 hana 17/09 system. How can we customize the display of the picture in the material list. I Have put a picture in the GOS without success. Is there another way ?